Exports are improving and exchange rates are shifting favorably. The Euro is getting stronger and so is the Mexican Peso. The EU is the world's largest dairy exporter and therefore, the most important exchange rate is the USD/Euro. Mexico is by far the biggest importer of U.S. dairy products, so this exchange rate is also very important. 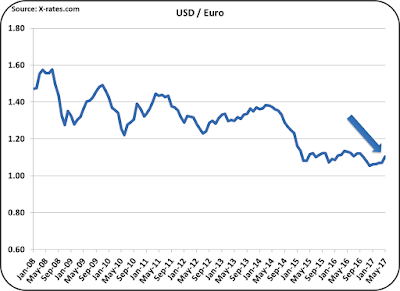 A ten year review of USD/Euro shifts shows the importance of this exchange rate. From 2008 through the start of 2017, the Euro has gotten consistently weaker vs. the USD. 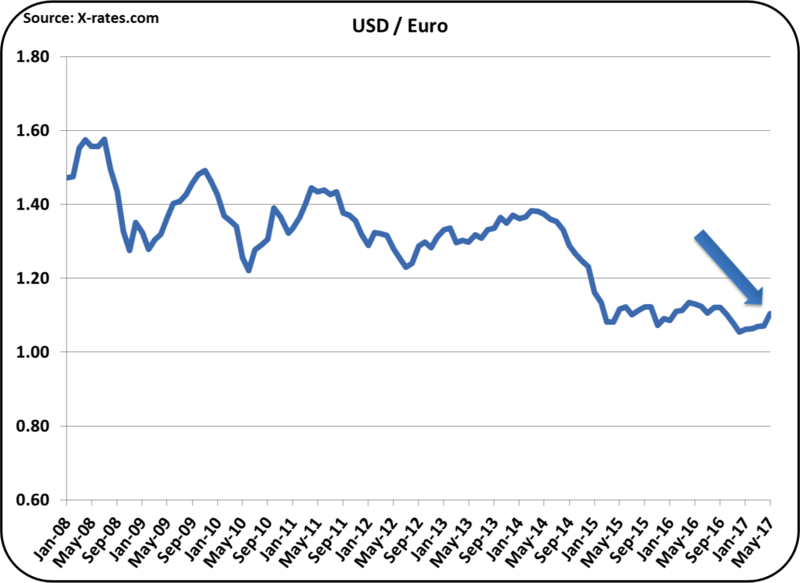 In mid 2008, the USD/Euro exchange rate was $1.55 per one Euro. In mid 2014 (an excellent time for milk prices, the exchange rate hovered near $1.40. At the beginning of 2017, that exchange rate fell to $1.08, a 30% drop from the highs of 2008. What does that mean? In 2008, a European exporter of cheese selling cheese for one Euro, competed evenly against U.S. cheese selling for $1.55. 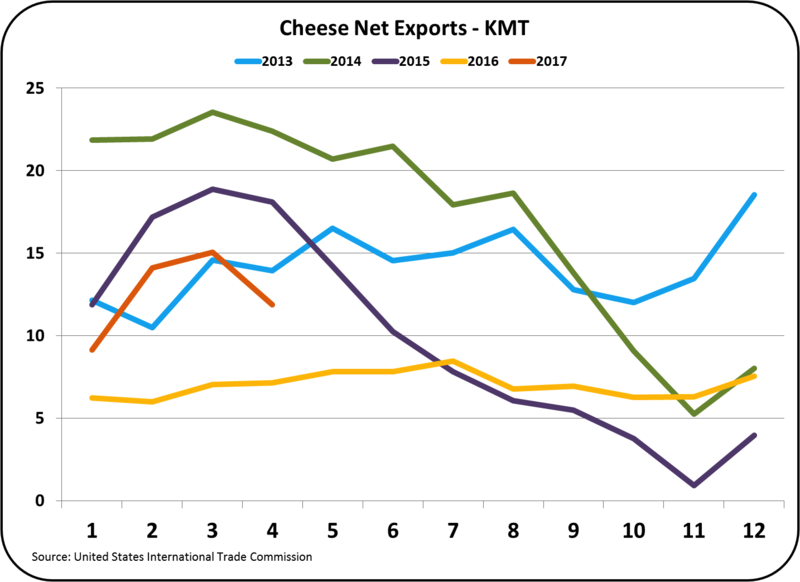 By the beginning of 2017, the U.S. exporter would have to price his cheese at $1.08 to compete evenly against the same EU cheese exporters in the international market. A strong USD always sounds good (stronger is better), but when it comes to exports, a stronger USD makes it more difficult to compete in the international markets. Currently, the exchange rate is $1.12, not a huge improvement, but hopefully a trend to a weaker USD and a better market for U.S. dairy products. The largest buyer of U.S. dairy products is Mexico. Unfortunately, from 2008 to early 2017, U.S. dairy products have become more expensive in Mexico due to the exchange rates. 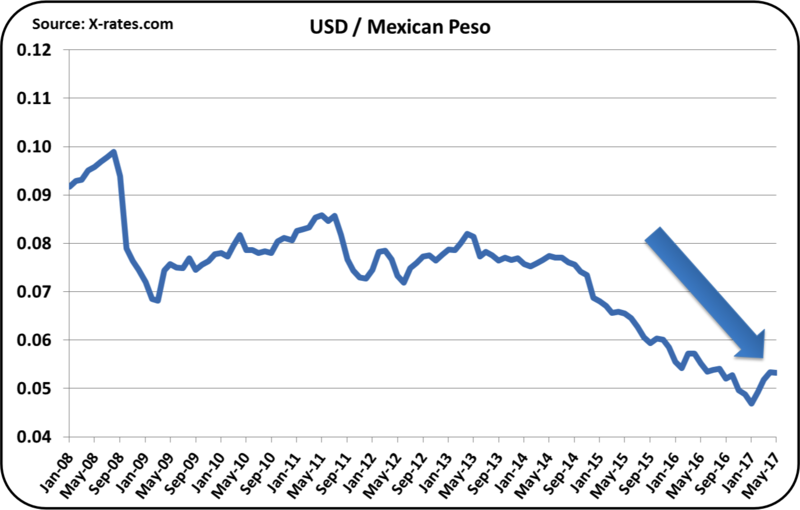 However, during 2017, the Mexican Peso has strengthened vs. the USD, making U.S. dairy products more affordable in Mexico. Dairy sales from the U.S. to Mexico continue to be robust. 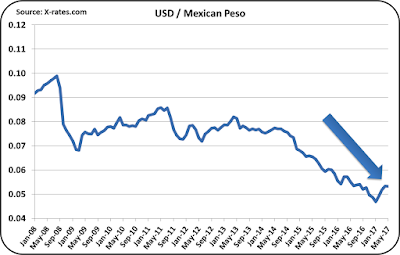 A stronger Mexican Peso should support additional purchases. However, not all exchange rates moved to the U.S. advantage. New Zealand is also a very strong international competitor. Roughly 80% of New Zealand's dairy production is exported. These exports are especially strong in the Pacific rim, but they are also strongly competitive worldwide. New Zealand dairy exports to the U.S. were up significantly in 2016. 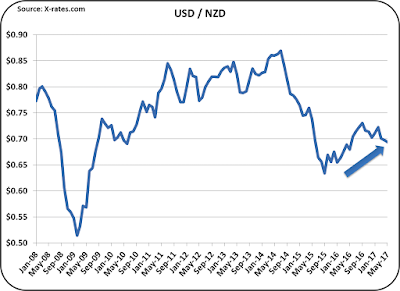 Unfortunately, the USD is continuing to strengthen against the NZD. As a result, New Zealand is again increasing milk production as exports expand. Dairy exports are very important to new Zealand's international trade balance. Cheese prices, and therefore Class III milk prices, fell by nearly 50% in late 2008 and early 2009. Class III milk prices dropped from $20/cwt. to $10/cwt. 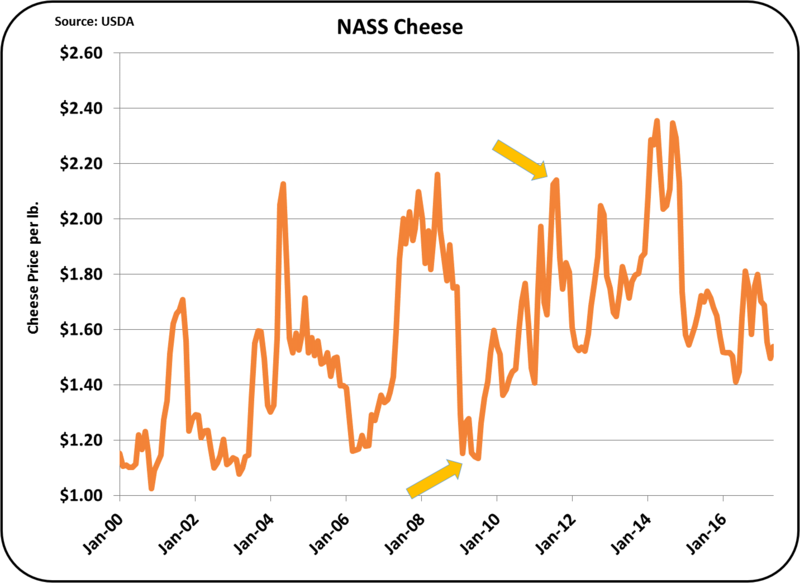 As the USD/NZD exchange rates reversed in 2010 and 2011, cheese prices and Class III milk prices improved. 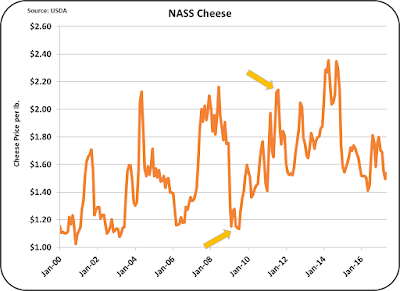 There is a 96% correlation rate between cheese prices and the Class III milk price. Dairy exports to Canada are about half the size of the exports to Mexico, but Canada is still the second largest importer of U.S. dairy products. 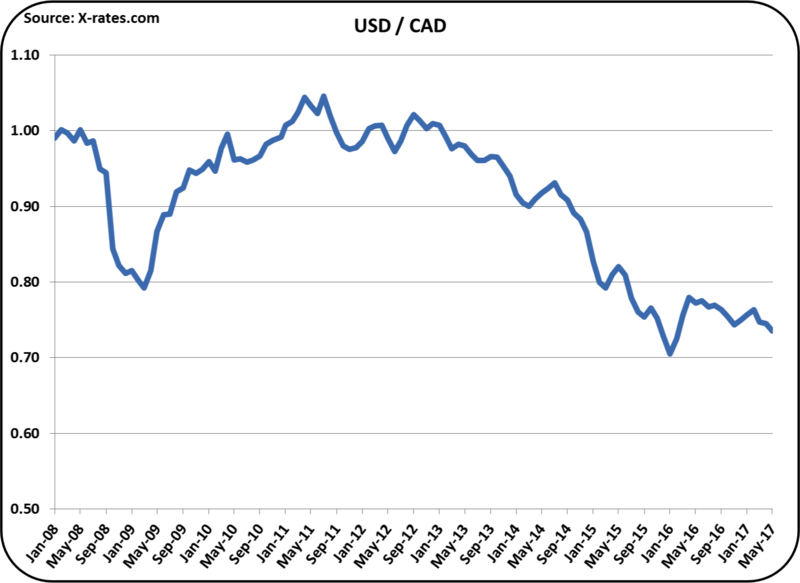 Unlike Mexico, the USD is continuing to strengthen vs. the Canadian dollar. The impact of this on U.S. exports to Canada have been overshadowed recently by the Canadian price controls on ultra-filtered dairy components which have reduced dairy exports to Canada. 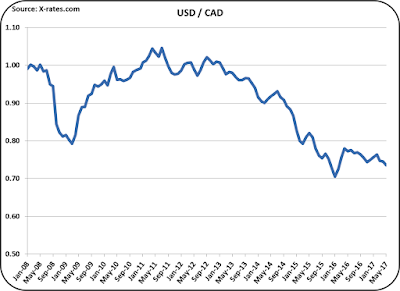 At this point, the adverse impact of a stronger USD vs. the CAD is having a minimal impact. 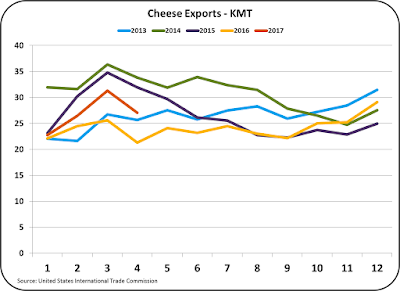 With the two most important exchange rates, the Euro and the Mexican Peso, moving in a positive direction, U.S. dairy exports should continue to make gains in the coming months. 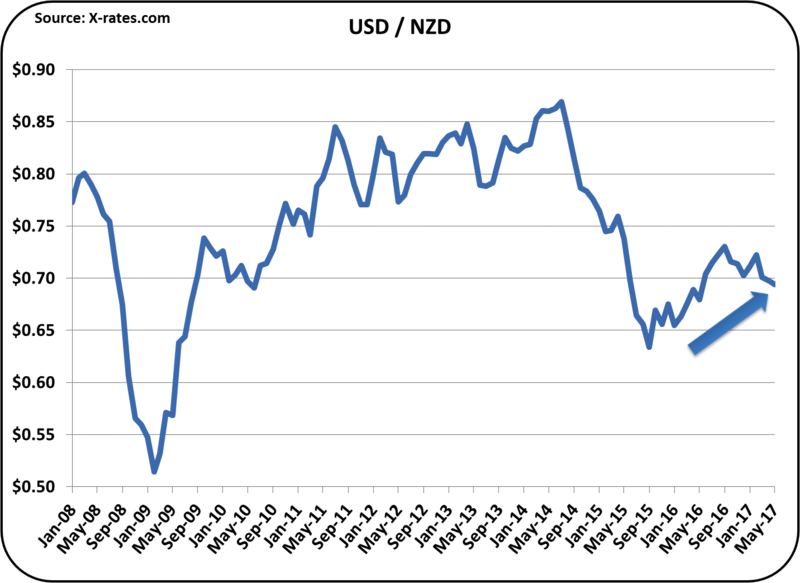 While the shift to a weaker USD vs. the NZD is troubling, the shift to date is minimal and should have a minimal impact on U.S. dairy exports. Exchange rate data is always very current and immediately available. Export/import data has a one month plus lag in availability, so the impact of recent moves in exchange rates cannot be correlated time-wise with the export/import data that is reviewed below. International prices of U.S. dairy products are impacted by international supply and demand (too much available product means lower prices), and by exchange rates. There are three factors that can influence U.S. dairy prices, domestic supply and demand, international supply and demand, and exchange rates. Of these three, exchange rates are the most volatile. Overall, U.S. dairy exports are continuing to improve. They are still well below the volumes and prices of 2014, but progress is still progress. 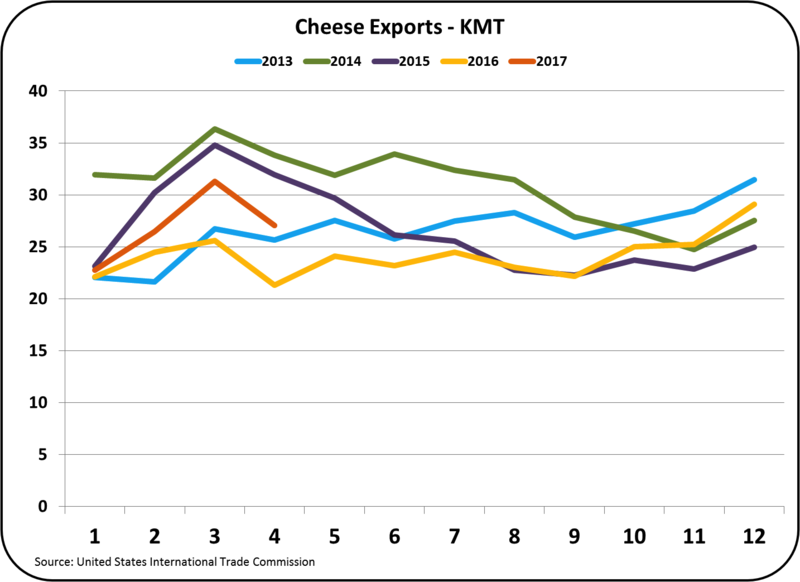 Cheese exports so far in 2017 are running well above 2016 levels. 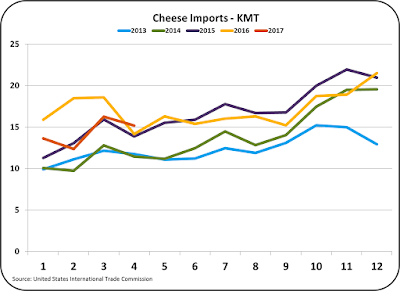 YTD, cheese imports are running below 2016 levels and close to 2015 levels. 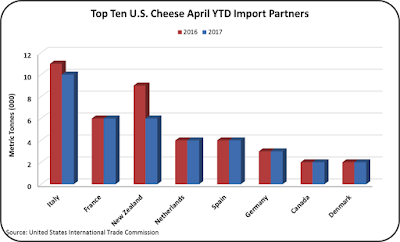 Lower imports mean more U.S. cheese is being used domestically. 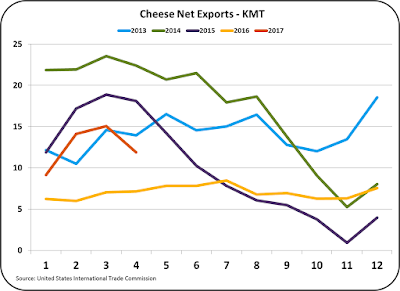 In total, cheese net exports (export - imports) are well above 2016 levels. While April numbers show a drop, this is most likely a short-term fluctuation, not a change in trends. 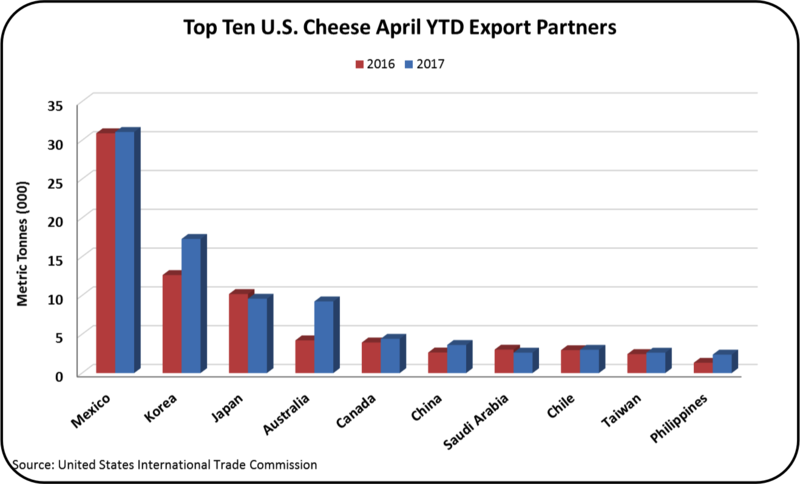 Mexico is by far the largest importer of U.S. cheese, but the increases are coming from South Korea and Australia. 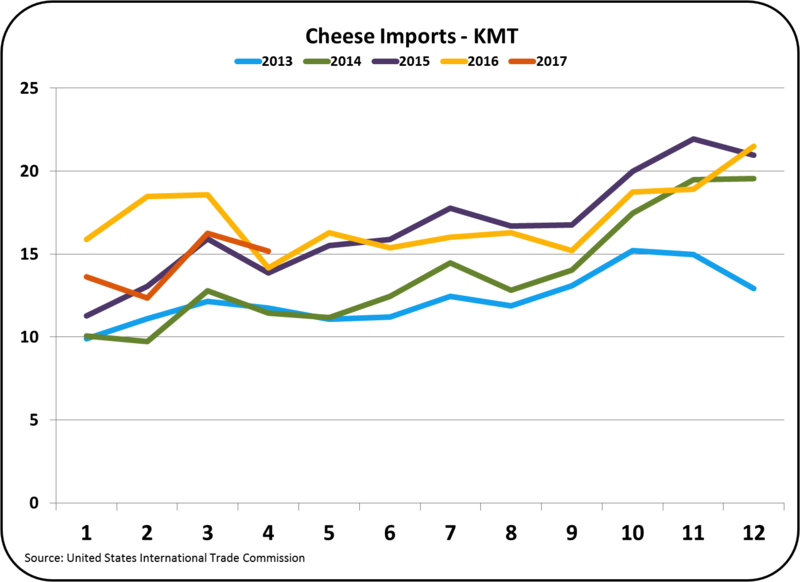 The reduction in imports has mostly occurred from reductions of cheese imports from Italy and New Zealand. 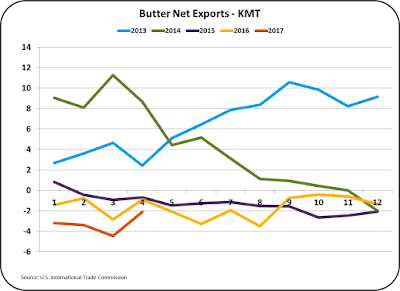 Butter exports remain near zero and imports are down, bringing net exports to a near "0" balance. 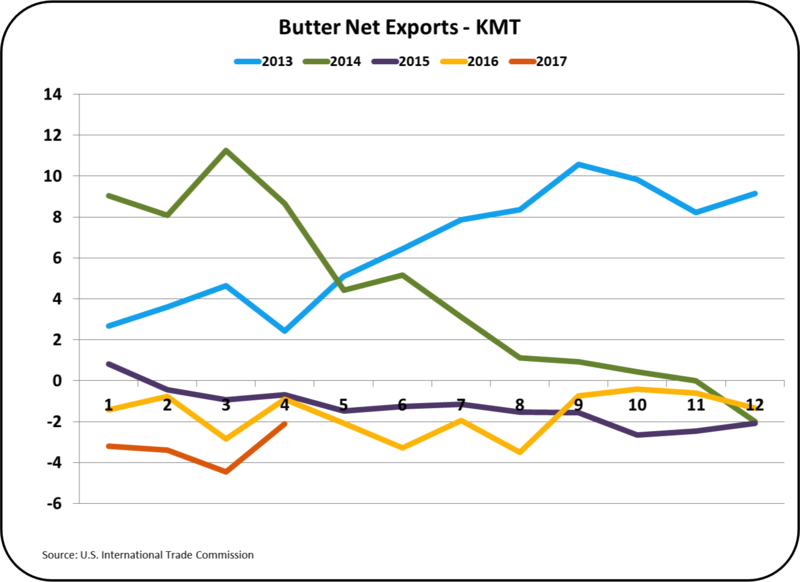 As reviewed in the prior post, the consumer demand for butter is outstripping production, so imports will likely increase. 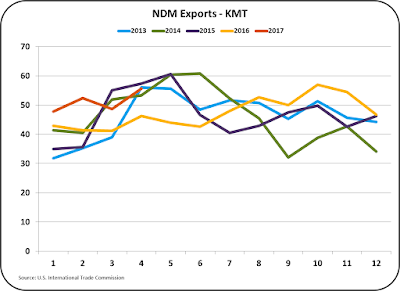 Exports of NDM continue at near record levels. NDM is the largest U.S. export product. Domestic prices are determined by international prices, which have improved, but are still well below 2014 prices. This post has been mostly about exchange rates. As the world continues to recover from the recession levels of 2008, the U.S. is a clear economic leader. This has caused the USD to strengthen against other currencies. Now the challenge is how to continue as a world economic leader, while reducing the strength of the USD. On June 1, May Class and Component prices were announced. They were generally up from the prior month. 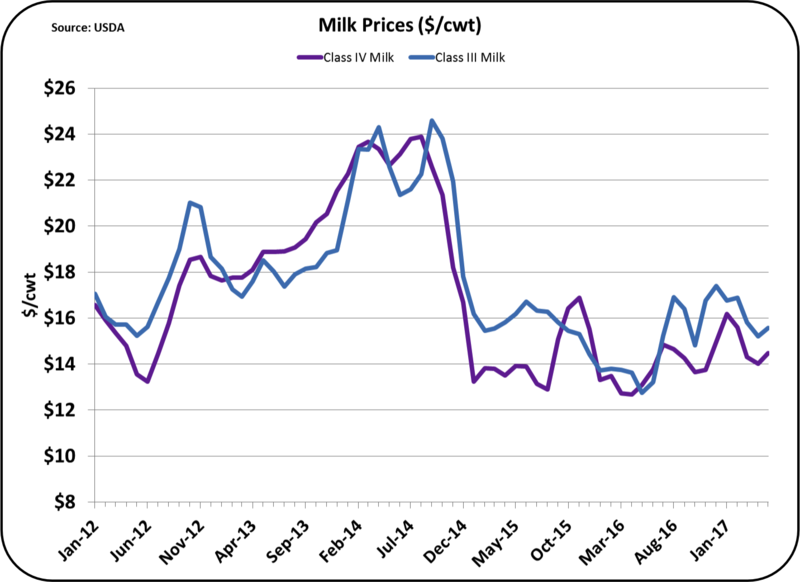 Class III milk increased 2.3% to $15.57/cwt. 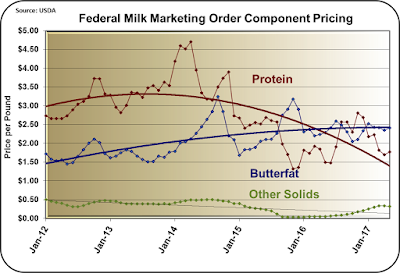 Butterfat also increased in value by 2.3% and milk protein took a major increase to $1.77/lb., a 4.5% increase. NDM, the basis for Class IV pricing, also had a nice increase of 3.8%. The only items in the red were dry whey, which is the basis for pricing Other Solids. 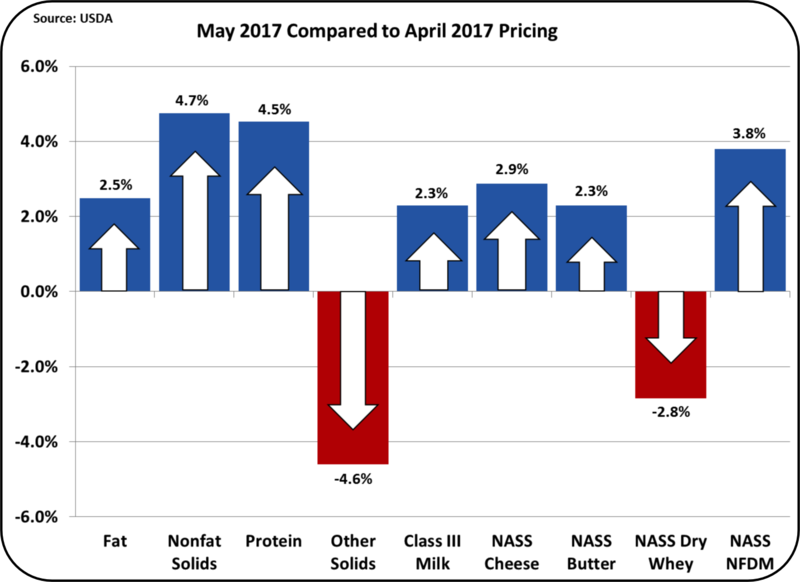 The long-term trends remain consistent with prior 2017 months with milk protein worth less than butterfat. Although Other Solids were below the prior month they remained near their current prices. 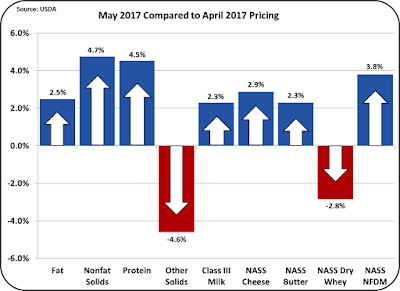 Dry whey has recovered nicely in 2017, but is still below the 2014 record prices. The price of dry whey us determined in the international markets. 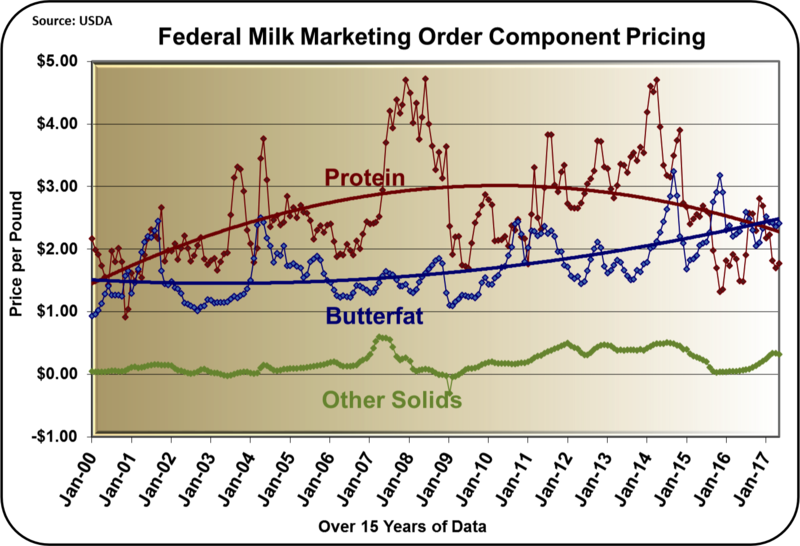 A closer look at the long-term trends shows a two year continuance of butterfat being more valuable than milk protein. 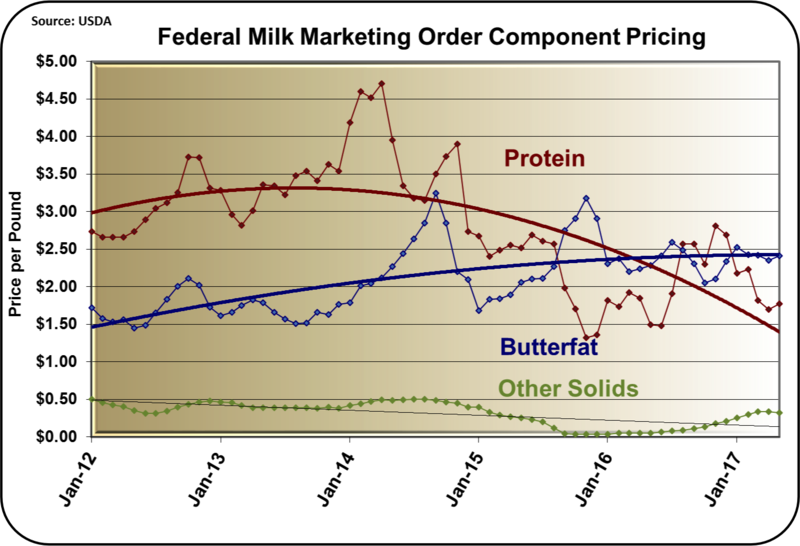 With pressure on butter inventories, caused by low production and increased domestic consumption ( See prior post on consumption trends), butter and therefore butterfat continues to maintain high prices. 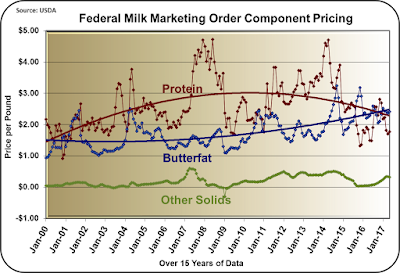 While a high price for butterfat seems like a good scenario for producers, it has a very minimal impact on the Class III milk price. 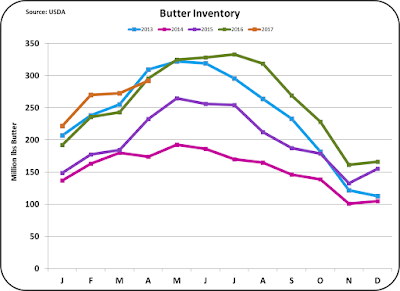 Butter inventories have returned to prior year levels at end of April. Butter production is running at about the same level as the prior year. Domestic consumption continues and the increased demand is being met with butter imports. Exports remain near zero. 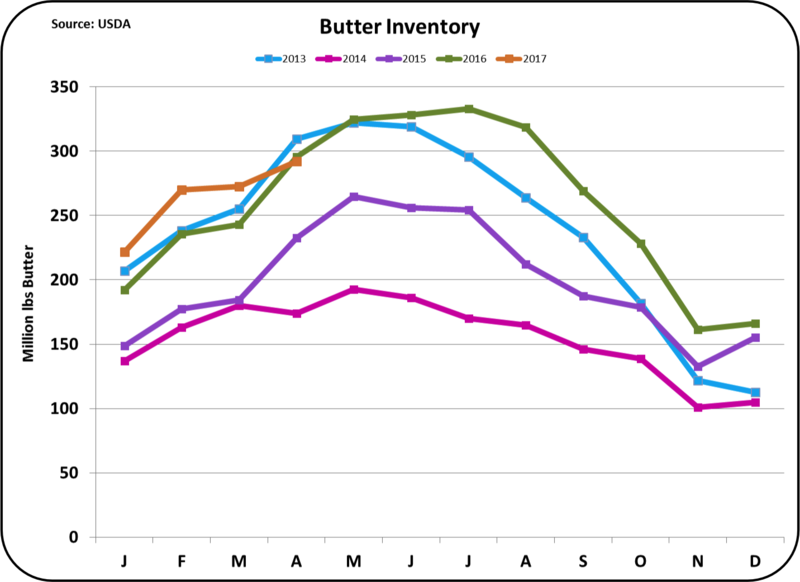 The high price of butter can be expected to continue throughout the remainder of 2017 as demand continues to grow and production continues at 2016 levels. 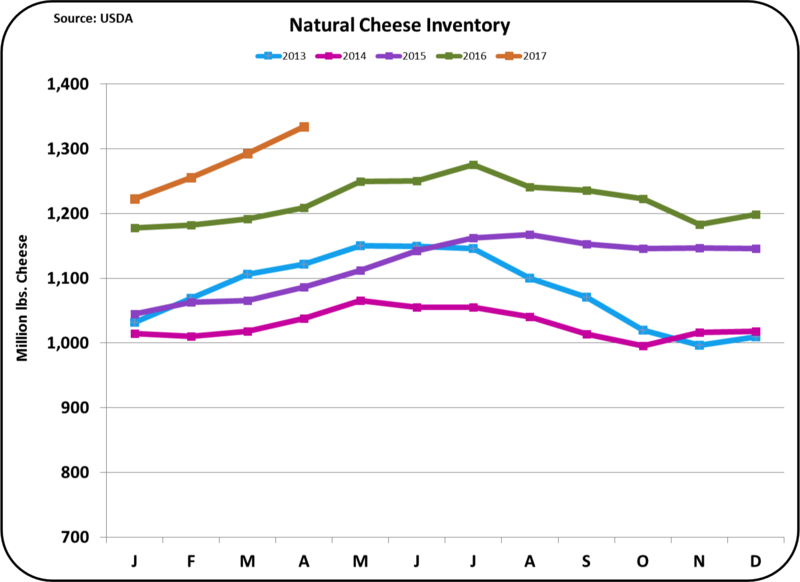 Cheese showed a nice increase in price in May, but inventories remain troubling. While there is increased consumption and increased exports, production levels remain above demand and inventories continue to grow to record levels. Domestic consumption cannot reduce this inventory. With an increasing milk supply, production will remain robust. A spike in exports is really the only solution. Exports (and imports) will be covered in the next post to this blog. Class IV milk can move the uniform milk price significantly (see this post for an explanation.) 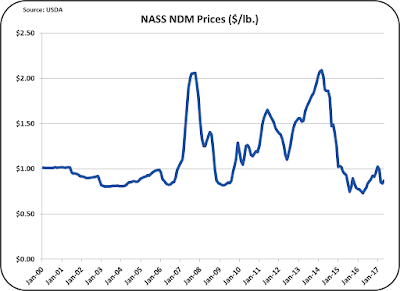 Class IV skim milk prices are determined by the price of NDM, which in turn is determined by the international price of NDM. 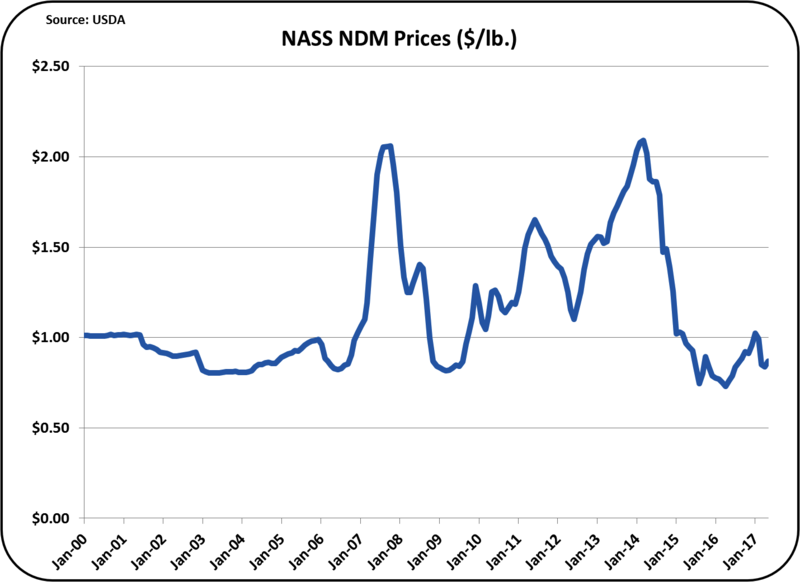 However, while the price of NDM has slightly increased from 2016, it is still way below the 2014 highs. Because of this, the Class IV price remains well below the Class III price, and will probably remain there for the balance of 2017. Therefore Class I milk prices will remain linked to the Class III prices. 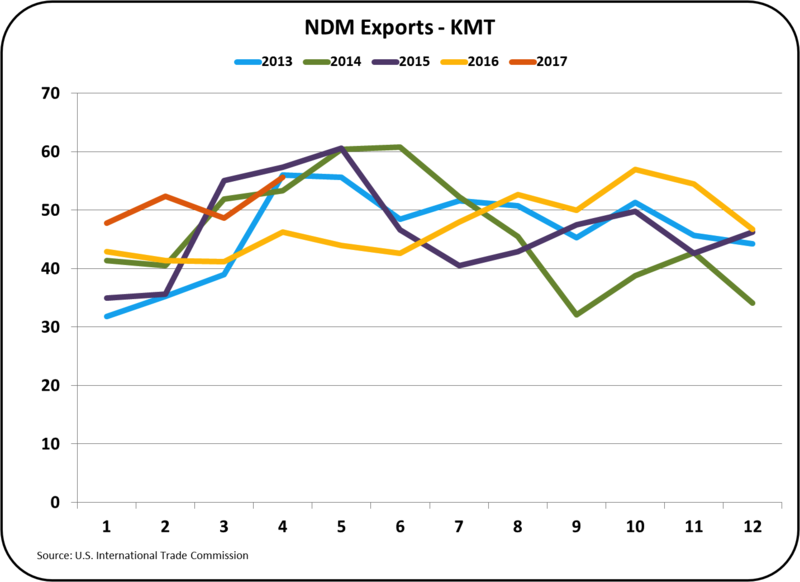 While NDM export volumes have been increasing to record levels, the price will probably remain low. 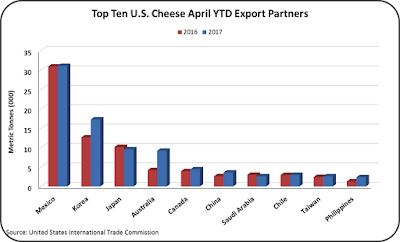 Probably this most important item to watch is exports of cheese. 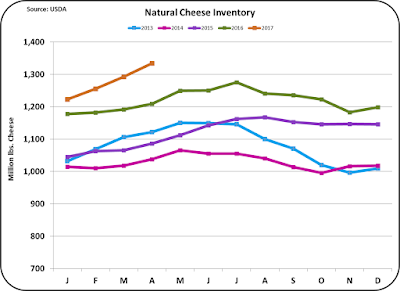 Cheese pricing is the most important variable in calculating the Class III price. Europe is the world's largest dairy exporter and has enjoyed an exchange rate advantage in the international markets. That exchange rate is now shifting toward a stronger Euro. A continuation of this exchange trend will make European products more expensive compared to the U.S. New export/import data will be available soon and will be covered in the next post to this blog.